Raising chickens organically, for eggs, meat or both, is a low cost project that provides a rapid return on your investment. Many chickens will begin laying eggs by the time they are five months old and extra roosters can be butchered for meat at around four months of age. To have an organic chicken farm, it is necessary to begin with organic chicks. To be considered organic, the chicks must come from fully organic chickens. The best place to find organic chicks is through local organic farms or breeders who can assure you that their chickens are raised organically. Visit the farm to see for yourself before you make a purchase. Baby chickens require warmth, fresh water, bedding and chicken starter feed. Organic chick starter feed can be used for the first 12 weeks. This feed contains all of the important nutrients for early growth and development. Small chicks are generally ready to be outdoors once they are about four or five weeks old and the temperature is above 60 degrees at night. Some people put their baby chicks out during the day but bring them back inside at night until they are eight weeks old. Be careful not to over handle small chicks and always keep them safe from pets and predators. 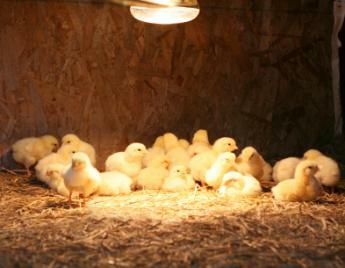 Many people keep young chicks in a box or small pen in their homes or outside in a garage or shed with a heat lamp. It is best to learn all you can about raising baby chicks before you bring them home. Organic chickens, also known as free range chickens, are not raised in the same manner as traditional commercial chickens. Organically raised chickens are not confined to a small, permanent pen or fenced area. Instead, they roam completely free or are moved frequently in a chicken tractor or moveable pen. Electric poultry wire is easy to move around once or twice per week, giving chickens new ground and a fresh supply of bugs and grass. Electric wire also protects chickens from predators. Contrary to popular belief, chickens do better with a coop or a house that has a mostly open front and room inside for nesting and roosting. Many modern day coops do not provide ventilation or light, two things that help to keep chickens healthy. Chickens have very sensitive lungs and need good quality air in order to thrive. To get the ventilation and light your chickens need, you might have to make your own coop, but that isn't as hard as it sounds. There are a number of excellent chicken coop plans available online. Fresh Air Poultry Houses is a book written by Prince T. Woods that talks about the importance of a well-ventilated chicken house and gives plan suggestions. The feathers on adult chickens are excellent insulators so you do not have to worry about cold weather. Heaters and heat lamps are not necessary once your chickens are fully feathered. 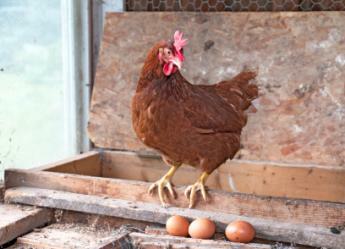 Egg laying chickens require nesting boxes; one for every three hens is a good number. Also, since chickens prefer to be off of the ground, providing roosting rods is necessary. 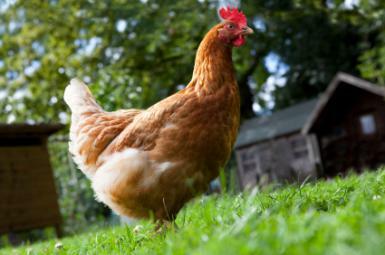 Organic poultry feed is available at local feed stores, but it can be very expensive. Many people who choose to raise their chickens on organic feed mix their own food. Ronda's Whole Grain Chicken Feed Recipe uses a number of whole seeds and wheat. Online organic poultry feed is available through a number of distributors like Scratch and Peck Feed Company, and New Country Organics. Raising chickens organically means raising chickens in a healthy, sanitary and comfortable environment. Healthy chickens are happy chickens and produce healthy eggs and meat as part of a sustainable lifestyle.